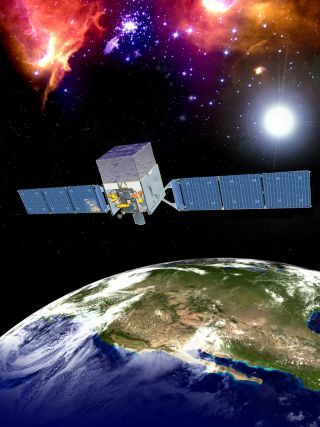 An artist's depiction of the Fermi Gamma-ray Space Telescope (FGST) in orbit. It's easy to take matter for granted. The stuff that makes up our planet and everything on it — as well as our sun and all the other visible objects in the universe — never seems to be at risk of disappearing in an instant. But around the time our universe was born, there may have been just such an instant — a moment when matter won out and something called antimatter did not. Tanmay Vachaspati, a professor of physics at Arizona State University and his colleagues think they have found a clue to this mystery. They say that a signal in the Fermi gamma-ray data suggests an overwhelming production of matter, but not antimatter, in the early universe. They detailed their findings in a paper published online today (May 14) in the journal Monthly Notices of the Royal Astronomical Society. Tonia Venters, a researcher at NASA Goddard Space Flight Center who works with Fermi telescope data, said it's important to practice caution. "I think the most important part is that we're seeing a suspicious signal in the data, and then the rest is kind of one step at a time," Vachaspati said. "We think the most likely candidate for why this is happening is the magnetic field. And then, if it is the magnetic field, then it seems most likely to me it's going to be this matter-antimatter asymmetry.